When I'm in the mood for quick, fast food type unauthentic Mexican food, I don't go to Taco Bell nor Baja Fresh. No, I tend to go to everyone's favorite un-Mexican Mexican restaurant for Americanized tacos and burritos. 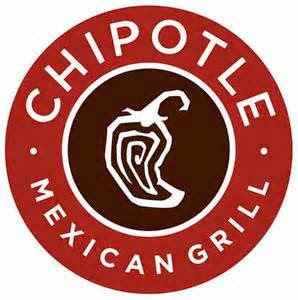 Here's the backstory to Chipotle: Chipotle Mexican Grill which was founded in Denver, CO in 1993 (somehow the Mile High City just doesn't scream Tex Mex the way a more Southwestern locale would). Anyway, the word "chipotle" means smoked chili. The company is worth approximately 19 billion dollars and in fact McDonald's once held a majority stake in the company. Chipotle uses approximately 97,000 pounds of avocados a day which translates to a whole lot of guacamole. Now here comes the fun part. What I have to tell you can give you more food for the same price which could potentially mean more savings for you. 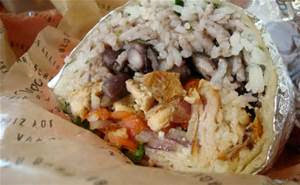 In Chipotle, you can order a vegetarian, carnitas (Mexican pulled pork), steak (carne asada), barbacoa, or grilled chicken burrito (a) or a burrito bowl (b) for the same price (see below). The primary difference is that a burrito bowl does not include a flour tortilla as its vessel to hold food the way a regular burrito does. As its name indicates, it uses a bowl. Okay, now here comes some math. 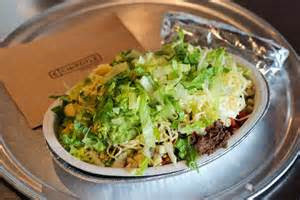 The average weight of a chipotle burrito is .634 pounds whereas the average weight of a burrito bowl is 1.082 pounds with all else being constant (ie same proteins, toppings, etc in both the burrito and burrito bowl). You don't have to be a math major to see that 1.082 pounds of Mexican goodness is better than .634 pounds for the same price. This is huge since ordering a burrito bowl gives you at least 70% more food, and this is already taking into account the lack of tortilla in the burrito bowl too! This difference in weight is probably due to the fact that a burrito has a limited amount of space for its contents in the flour tortilla. So next time when you're feeling really hungry and have a hankering for some fake Mexican food, order a burrito bowl instead of a regular burrito to get more bang for your buck. Also, don't be afraid to ask for something on the side whether it's the salsa, sour cream, cheese, or guacamole. They're always willing to accommodate your request by putting a condiment in a small container for you. That and even though the line may be long, the Chipotle employees do a really good job moving the line along in a very efficient way. On a personal note, my standard burrito bowl configuration is the grilled chicken burrito bowl with brown rice (instead of the cilantro lime white rice), black beans (instead of pinto beans), extra fajita vegetables (onions and green peppers - they don't normally offer this to you but don't be afraid to ask), both mild tomato and medium tomatillo-green chili salsas (sometimes the hot tomatillo-red chili salsa on the side), cheese, sour cream, corn, and romaine lettuce. I do like guacamole, but I don't like having to pay extra for it. If I'm not terribly hungry, I would often just eat half of the bowl and save the other half for another meal which makes it out to be no more than $4 per meal. What you can also do is order from the secret menu. Just like In-N-Out, Chipotle has a secret menu where you can order a “Quesarito” (burrito made using a cheese quesadilla instead of a regular flour tortilla as the wrapping), nachos (chips with the usual Chipotle fillings and toppings piled on), or a single taco (instead of having to buy the standard set of 3 tacos).